"I appreciate the technology at SPPS and that the use of it is taught in meaningful and sound ways. My son has better power point skills than some high school kids I've watched." We embrace STEM! For instance, on October 12, 2017, the 5th through 8th grade will participate in a presentation called Create Music: STEM camp. The students will design a musical instrument, use a 3D printer to make it “come alive”; work with synthesizers to make music and then learn how to use coding to actually write their creative melody. We are always looking for ways to bring excitement for the sciences into our classrooms. Nationally recognized for our technological leadership in 2001, we've spent the last decade and a half weaving technology into our curriculum. A $141K grant allowed us to replace all 50 of our computers, nine printers and add 24 handheld devices along with increasing our bandwidth. We have computer whiteboards in every classroom that are an integral part of our teaching curriculum. Sts. Peter and Paul School continues to offer every student a vast array of computer related teaching tools. Computers are housed in the classrooms, not in a computer lab, so students have constant access. Our student/computer ratio is 2:1. Our students use computers for Accelerated Reading, Accelerated Math, Type to Learn, Hyperstudio, Power Point, desktop publishing, distance learning, live conferencing and the filtered internet. We are extremely proud of how many of our graduates choose science and technology fields when pursuing college degrees. We work hard to not only educate our students well in science, but we constantly strive to engage their interest as well. Here, our littlest students work on ABC matching aided by teacher, Sara Wilkinson. 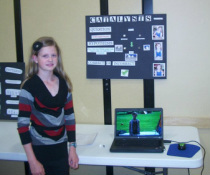 Our 5th & 6th grade students hold a science fair every other year. Each student in those grades makes a science project that they share with their classroom. During our spring program, they explain and demonstrate their project to the other students in our school and to the parents of our entire student body. By the time a student leaves our school, they have created & publicly presented two science projects and have listened to science project presentations all eight years. ​We've hatched a lot of steelhead! Most years, we have an aquarium in our hallway with hatching steelhead. We like to present projects from which all students can learn. When all of the eggs are hatched, the 7th & 8th graders release the fish into the Clearwater River. ​This is one of many hands-on science projects presented at the school each year.